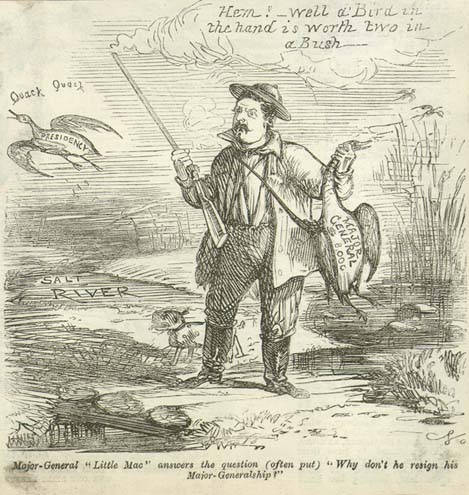 Description: McClellan stands with a rifle in one hand and a duck in the other. The bird’s body reads, “Major General $8, 000.” Another duck labelled, “Presidency” is flying into the background over a “Salt River.” The smoke coming from the rifle’s barrel reads, “Hem! — Well a Bird in the hand is worth two in a Bush.” McClellan had lost the 1864 presidential election to Lincoln. He retained his generalship so that he would continue to have an income even if he had no post.